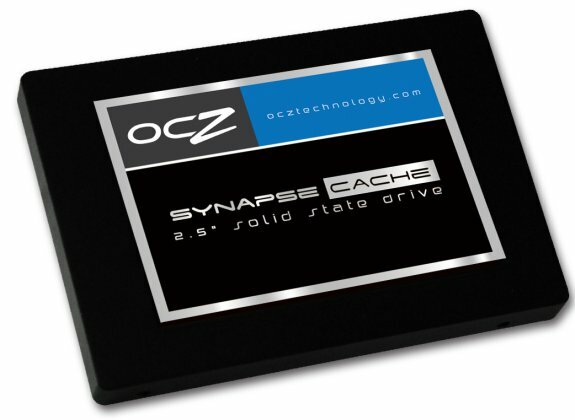 OCZ introduced the Synapse Cache, a new 2.5" SSD series designed for high-performance caching. These MLC NAND flash disks offer a MTBF of 2 million hours and 3-year warranty. The 64GB model promises read speeds of up to 550MB/s, write speeds of up to 490MB/s and random write 4k performance of 75,000 IOPS, while the 128GB edition has the same max read speed, max write speed of up to 510MB/s and random write 4k performance of 80,000 IOPS. OCZ warns on its product page that users can expect a discrepancy between reported capacity and actual capacity, as the Synapse SSD uses 50% NAND flash overprovisioning to accommodate performance and software features. OCZ Technology Group, Inc. (Nasdaq:OCZ), a leading provider of high-performance solid-state drives (SSDs) for computing devices and systems, today launched its Synapse Cache Series 2.5” SSDs. The new Synapse SSDs are optimized for caching applications and leverages Dataplex™ cache software to dynamically manage the Synapse SSD in conjunction with standard hard disk drives (HDDs), to provide users with SSD-level performance across the entire capacity of the HDD.